Nathan Glenn at Basil’s Renaissance. Glenn Foods’ fast-casual concept, Basil’s, has opened a location at Renaissance at Colony Park. 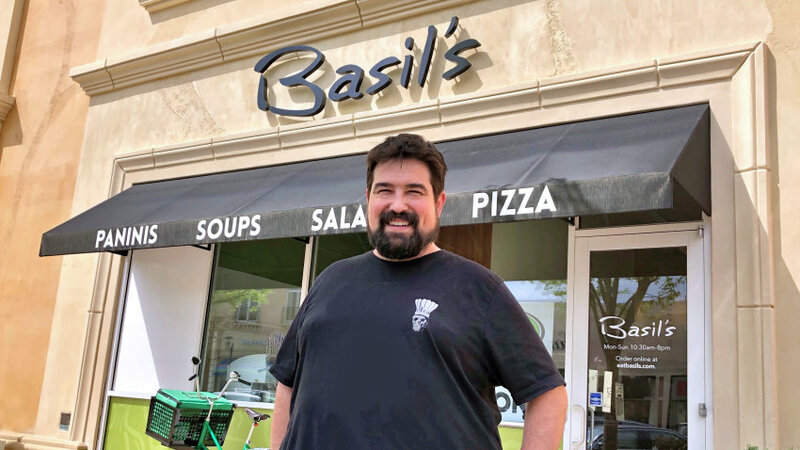 Nathan Glenn, who also owns Basil’s with his father, Tim Glenn, said longtime Basil’s customers will notice new offerings to the Renaissance menu, changes Nathan said will eventually make their way to the Fondren location. The Basil’s box ($11.95) gives diners the choice of a sandwich and a side, along with a dessert taster (banana pudding or chocolate chip cookies), sweet heat pickles and a deviled egg. The Southern Sampler ($11.95), a staple at Basil’s Fondren, is now a “pick-three” with a choice of chicken salad, pimento & cheese, potato salad, coleslaw, three deviled eggs, sweet heat pickles or bow tie pasta. A “quick-grab” cooler makes purchasing a dozen deviled eggs, pints of pimento & cheese, cold chicken salad, pickles or dressing easy while par-baked pizzas are vacuum sealed with instructions for a take-home meal. A gluten-free pizza crust – made with cauliflower – will also be available. Basil’s will offer bicycle delivery in a limited “central business district” around Renaissance in about 30 days. EatBasils.com will open online ordering for individuals, corporate catering and third-party services like Waitr and DoorDash. Construction began in mid-January after seeing the shopping destination’s success for fellow restaurant owners. Nathan cited Renaissance’s growth ­– a six-screen Malco movie theater is slated to open in the fall – and hotels at The Township, along with accessibility to Ridgeland and Madison, as a driving factor for the location. Hours for Basil’s Renaissance are Monday – Sunday, 10:30 a.m. – 8 p.m., extending later if there is demand. Basil’s Renaissance is in Suite 8003 in Ridgeland. The Fondren location is at 2906 North State Street at Fondren Corner, along with sister restaurant, Rooster’s. A downtown Jackson location of Basil’s is owned by Nathan’s mother, Debbie Rankin, and sister and brother-in-law, Ashley and Michael Laskin.